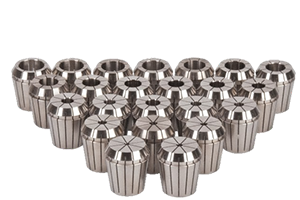 We provide standard, custom, and re-sharpening of end mills, drills, reamers, dovetails, porting, cavity tools and much more. Welcome to Accurate Cutter Grinding Inc.
We take pride in our top notch customer service and respect our customers time constraints. We provide expedited tool turn around, competitive pricing and quantity discounts. Accurate Cutter Grinding Inc. is proud to announce the acquisition of a new EDM drilling machine that will greatly reduce delivery time of coolant through cutting tools by completing this in house. Please email for information on how coolant through tools can benefit your machining application. Accurate Cutter Grinding is now offering ER collets. As a great addition to our round shank cutting tools. Our ER collets are available in sizes ER11 to ER40 in both inch and metric. ER standard collets have a 0.0002" T.I.R., with a clamping range of 0.039". All ER collets are currently in stock and available to order online by using a Purchase Order number. Accurate Cutter Grinding Inc. is proud to announce the acquisition of a new EDM drilling machine. 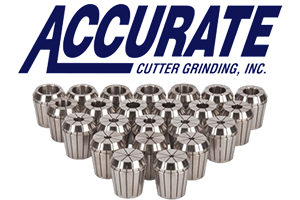 Accurate Cutter Grinding Inc. has added it's 9th CNC Grinder. We have purchased an Anca GX7. Accurate Cutter Grinding Inc. is now selling ER Collets. Accurate Cutter Grinding Inc. has purchased a new SAACKE UWIF Tool Grinding Machine. Accurate Cutter Grinding Inc. has purchased a new TRU TECH Revolution T23X. Visit the TRU TECH website. Accurate Cutter Grinding Inc. purchased and moved into a 12,600 sqaure foot air conditioned facilty. Accurate Cutter Grinding Inc. has purchased a new SAACKE UWID Tool Grinding Machine. Copyright © 2010 - 2019 Accurate Cutter Grinding Inc.
Website designed, hosted and managed by: Wellstronics Inc.